Within Geisha society, women are in charge of their own destiny. In the Hanamachi districts of Japan, the structure of life is almost entirely matriarchal; audiences are present merely to be beguiled by the spectral illusion created by female artists of the floating world. Traditionally, Geisha in training – called Maiko – wear Okobo platform sandals carved from willow wood, which are held to the feet by fabric thongs coloured to indicate their status. In the summer months, Maiko will put on black-lacquered iterations, preventing kimonos from sweeping the ground as they teeter along the pavements. 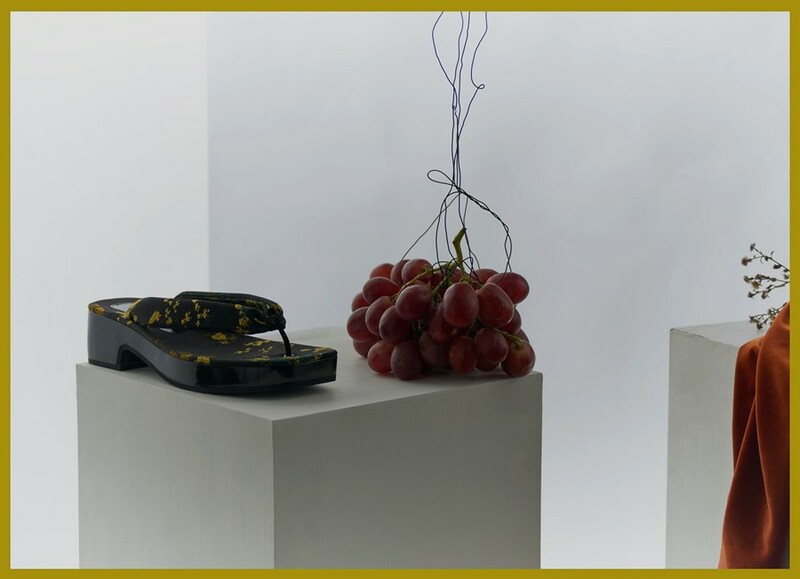 Belgian designer Dries Van Noten has lucidly referenced the traditional footwear of Geisha by translating the elevated style into a springtime brocade sandal. Green and gold cherry blossom print meets with a glossy black sole, alluding to the click-clacking of feet against the floors of teahouses and kabuki theatres. Wear yours to channel the arresting command of these women – for the power that they possess over spectators is one that should undoubtedly be incorporated into the office, the home and awkward run-ins with ex-lovers alike.